Pauline was Mario’s first known love interest and damsel in distress, but he apparently dumped her when he had the chance to date royalty. Really, we don’t know what happened between them, but they seem to still be friends. 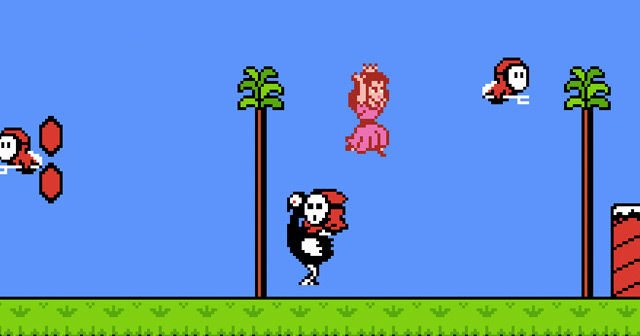 Originally known simply as “the lady” to Mario’s Jumpman, the prevailing theories are that she was named after the wife of the Nintendo of America warehouse manager or the frequently captured heroine of the film series The Perils of Pauline, or possibly both. As the original Donkey Kong game was originally envisioned as a Popeye property and developed into sort of a King Kong analog, I suppose she’s sort of a cross between Olive Oyl and Ann Darrow. She’s portrayed as having reddish-blonde hair and wearing a pink dress and high heels, although artwork tended to make her hair just plain blonde. Later, she was changed to a brunette, probably so she’d look less similar to Peach, although the Princess had brown hair in Super Mario Bros. 2 and 3. She seems to generally have a less modest appearance than Peach, wearing slinky, low-cut dresses and more makeup and jewelry. Most recent renderings of her make her look Italian like her old flame. 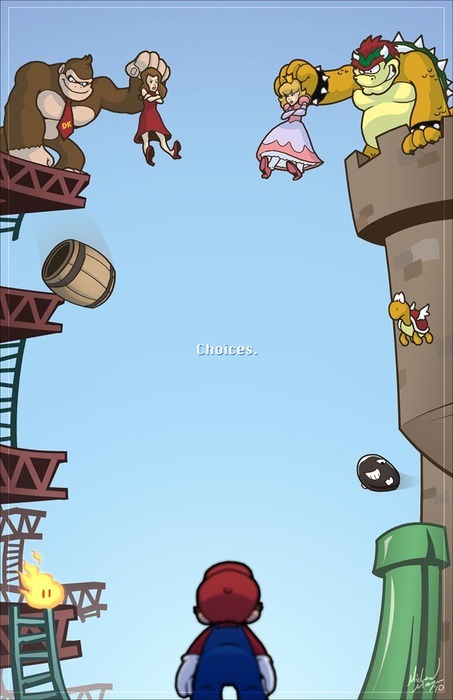 Mario can retrieve her hat, parasol, and handbag for extra points. Interestingly, I believe the DK cartoon on Saturday Supercade made her Mario’s niece, and the animal handler at his circus. This doesn’t really fit too well with the Mario universe as it developed, as she’s presumably not Luigi’s daughter and we don’t know of Mario having any other siblings. 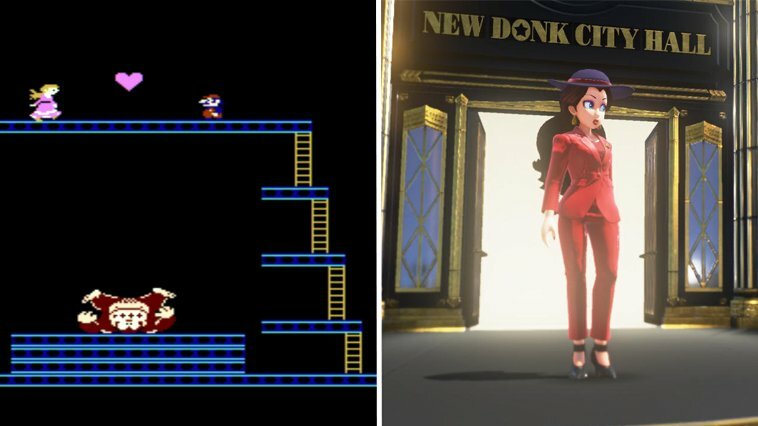 I’ve mentioned before the theory that Jumpman and the original Pauline are the parents of the modern-day Mario Brothers, in which case I guess the Pauline of the Mario vs. Donkey Kong series could be Jumpman’s niece and Mario’s cousin. I believe it’s made clear in Super Mario Odyssey that she’s been the same character throughout, however. 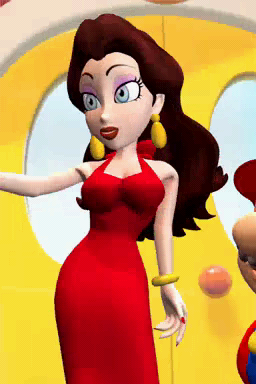 It’s presumably the younger DK who kidnaps her in the Mario vs. DK games, though, so does that mean he and his grandfather had a thing for the same woman? That’s kind of creepy. What is it about her that appeals so much to apes? And wasn’t the future Cranky already married? I mean, he had a kid, right? The younger Donkey’s relationship with Candy Kong isn’t quite as certain. I’ve seen several fan works that put her in a consensual relationship with DK (not sure it matters which one), as has been done with Peach and Bowser. 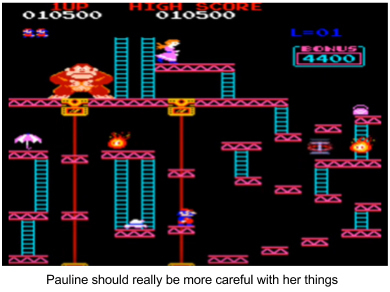 The Mario Wiki page on Pauline gives a lot of information about her appearances in various media, and it sounds like she’s had a variety of jobs, if not quite as many as Mario. While she’s a guest of honor in March of the Minis, later games in the Mario vs. DK series have her helping Mario to run the factory and the associated theme parks. There’s a Super Mario-kun storyline where she runs a clothing store where both Mario and DK shop. In another manga, she worked as a mechanic and an acrobat. 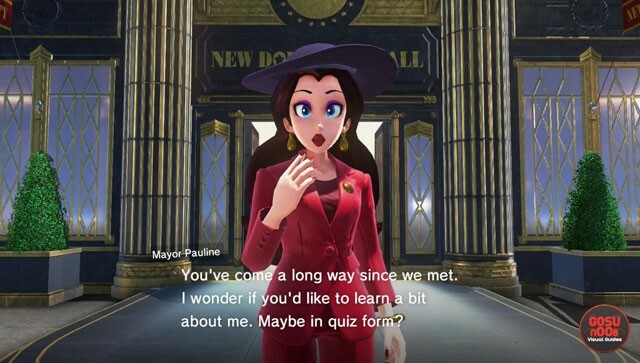 In Odyssey, she’s the Mayor of New Donk City, and apparently has had experience as a nightclub singer. Producer Yoshiaki Koizumi said that he wanted to include leaders in the game who weren’t royalty, even though all of the countries were called kingdoms. She comes across as a bit self-absorbed, asking questions about herself, bragging about her approval rating, pretty much demanding a birthday present from Mario, making disparaging references to packaged cake, and having her face on the currency (although I guess that last one might not have been her idea). She does admit that that she’s not good at fixing machinery, so presumably that comic where she’s a mechanic wasn’t taken into account. Her favorite possession is her hat, presumably the same one you could get in Donkey Kong, or at least in the same style. During the New Donk Festival, she sings the theme song “Jump Up, Super Star!”, a jazzy number with a chorus that I find similar to the Super Bell Hill music from Super Mario 3D World, probably partially because they both feature saxophones. Regardless, I’m hoping her prominent role in Odyssey means she shows up more in Mario games other than the Mario/DK sub-series. This entry was posted in Cartoons, Comics, Donkey Kong, Mario, Music, Relationships, Television, Video Games and tagged candy kong, cranky kong, jump up super star, jumpman, kate higgins, king kong, luigi mario, march of the minis, mario vs donkey kong, new donk city, pauline, princess peach toadstool, saturday supercade, super mario bros. 2, super mario bros. 3, super mario odyssey, super mario-kun, yoshiaki koizumi. Bookmark the permalink. “Whistle While You Work” makes sense as a comparison, at least as far as the rhythm goes.